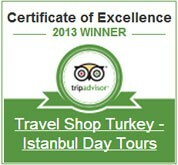 TravelShop Turkey wishes you a warm welcome. We are the main tour operators, Travel Agency, member of TURSAB Turkish Travel Agents Association, ASTA American Society of Travel Agents member, ETOA European Tour Operators Association, ATTA Adventure Travel Association and WRTA World Religious Travel Association member located in Turkey. Our Licence number is 5291, registered under TravelShop Turkey & Murti's Tour alliance group. We are also proud members of the world's oldest and largest international ecotourism association The International EcoTourism Society. TIES seeks to be the global source of knowledge and advocacy uniting communities, conservation, and sustainable travel. We offer over 800 different tours, 2000 Hotels, 500 Villas and 200 Yacht Cruises to different destinations in Turkey, Egypt and Greece. Our tours and itineraries are prepared in accordance with the views and critics of more than 6000 tourists. We have taken into account and considered every single email, fax and feedback form to refine existing tours and developed new tours to meet your expectations. When you book your tour with us you have our guarantee that no promise will be broken every aspect has been taken into account for your enjoyment, and all the hard work is done on your behalf. 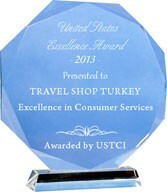 Please consider TravelShop Turkey. We are friendly and at your disposal. We are also here to listen to your ideas, to help improve our quality of service and create future tours. We encourage criticism and feedback. To make your dreams come true in Turkey, choose Travel Shop Turkey it's our life! With our online site, booking information and consultant services we are able to handle your requests on a global scale either via email, fax or phone. We are always available and encourage any questions. We are dedicated to providing the very best in quality service. Our team is a wonderful group of travel professionals all with their own specialized areas. You can be sure at least one of us has the knowledge that you need. Our tours have been tailor made with this knowledge and our quality of service is next too none. 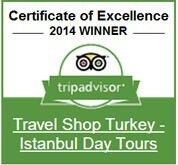 Throughout Turkey we offer tours, hotel bookings and transportation within Turkey and to neighbouring Islands. 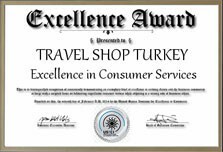 We are committed to finding the very best value for money with out losing quality of service and product while enhancing your experience and time in Turkey bringing you the very best that Turkey has to offer. TravelShop Turkey insists on ethical and eco-friendly business practices, providing ethically and ecologically sound holiday packages and authentic local accommodation all over Turkey. It is our policy to benefit the local economy, promote and support ethical labour practices and work in line with conservation and sustainable environmental policies. TravelShop Turkey offers beautiful holidays full of character and charm, at great value for money and with the reassurance of grass-roots responsible tourism. Travel Shop Turkey 's aim is to become the leading tour company within Turkey, utilising and enhancing technology, information, and resources from around the globe and within Turkey. Our online project aims to be the most innovative and informative reference guide for anyone interested in Turkey and what it has to offer for the traveller. Most importantly we want to offer the best and the most efficient travel tours throughout Turkey, whilst maintaining quality of service, quality of life and value for money. In addition, Travel Shop Turkey offers many unique products, such as Hop on Hop off packages all around Turkey all the year around. By taking the Hop on Hop off service you will enjoy a flexible trip, leaving the bus in any of our destinations and just taking the next bus available. 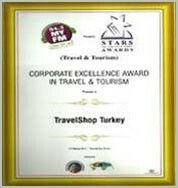 Travel Shop Turkey is not just an online Tour Operator, as the company has been assisting many different International Tourism Fairs and Workshops all around the world and have done lots of sponsorships for Tourism industries, such as TV, magazines and newspapers. By traveling with Travel Shop Turkey you will see at one of this fairs. 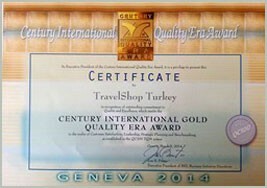 We have received a Certificate of Excellence from Trip Advisor, the Century International Quality ERA GOLD category from Geneva and Corporate Excellence award in travel and tourism. We have representative offices in USA, Canada, Australia, New Zealand, UK, South Africa, Greece and India. If you are looking for a local agency in your area to book a tour, please inform us so we can pass you our local agency contact details.